For any machining operation, coolant plays an important role for achieving desired quality of Surface Finish, Dimensional Accuracy, Repeatability, Productivity and Tool Life. The present methods of Filtration include Paper Band, Magnetic Chip Separator on a conveyor etc. These units encounter problems of paper clogging, dirty coolant escaping from side of paper Band and over Conveyor and cost of paper replacement. Oilmax OMF 100 has been developed for effective filtration wifout above problems. The coolant passes over powerful rare earth magnets and finest particles of metal and abrasive are collected by magnets and clean coolant is returned back to the machine. Clogging of grinding wheel is prevented hence more jobs per dressing, increase in diamond dresser and grinding wheel life. Extended life of coolant and less wear and tear of tools. 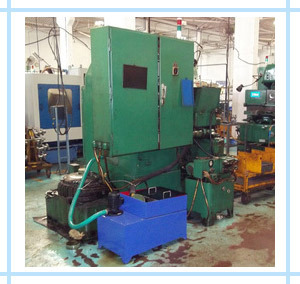 Reduces down time of machine for change of coolant, hence improvement in productivity. Reduction in abrasive particles in coolant going into machine slide ways and theirby increase in machine life and better repeatability. Better cleanliness of machine and surroundings. Effective Filtration, No Replacement Element, No Recurring Cost. Substantial increase in coolant life. No moving parts hence no maintenance required.